Leaving Penicuik under a blanket of snow, Penicuik travelled north to find a perfect playing surface at Broomfield Park Montrose. However, a strong, bitingly cold northeast wind blowing the length of the park turned the match into a game of two halves. 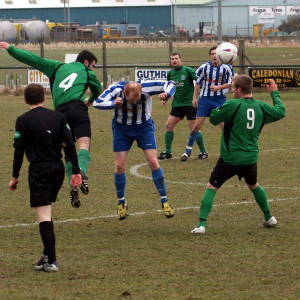 Penicuik kicked off with the wind behind their backs, but the first chance fell to Montrose. Watson beat the offside trap, raced in on goal, but dragged his shot inches wide of the keeper’s right hand post. In the 6th minute, following a throw in to Penicuik, Harvey turned quickly to curl a strike narrowly past the junction of the post and crossbar. 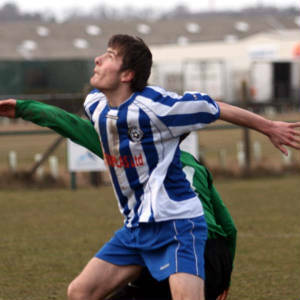 One minute later, Penicuik took the lead when Harvey played in strike partner Miller. His shot beat the keeper but was going past the post when MONTGOMERY rushed in to squeeze the ball home from the tightest of angles. In the 13th minute, a free kick to Penicuik was blocked by the defensive wall, driven back in and blocked again, and a third strike on goal was tipped round the post by keeper McLeod. Then in the 27th minute Penicuik doubled their lead when a Steel free kick was headed on by Harvey and livewire MILLER, took one touch and drilled the ball past McLeod. 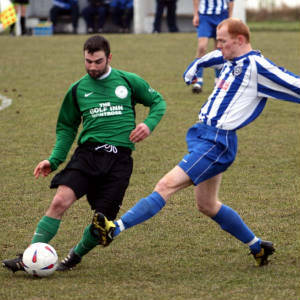 Penicuik continued to dominate play with the wind playing a determining factor in the game. It was not until the 42nd minute before Penicuik created another chance, but Montgomery was denied by an excellent save by McLeod. The second half started with Montrose piling on the pressure, but Penicuik managed to weather the storm and gradually got back in the game. In the 56th minute, an overhead kick by striker Harvey was comfortably saved by McLeod. Three minutes later, Gay had a great chance at the back post but failed direct his shot on target. In Penicuik’s next attack, Montgomery got round the back of the Montrose defence and cut the ball back to the edge of the box where McKenna saw his powerful strike deflected narrowly past the post off one of his own players. Immediately afterwards, McLeod had to rush out to smother the ball at the feet of Harvey. At the other end, substitute Kerrigan was unlucky to see his strike blocked for a corner. From the corner, Bald failed to hold the ball but Graham ballooned the ball over the bar from inside the box. Montrose cut the deficit in the 67th minute when they were awarded a penalty after Bald tripped Kennedy in the box. GRAHAM competently converted the penalty. Two minutes later, Montrose had another great chance, but Bald was well placed to save. 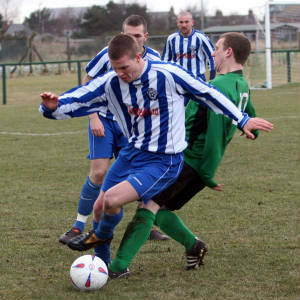 Montrose continued to press but the Penicuik defence coped with everything they could throw at them. With two minutes remaining, Kennedy got his marching orders after receiving a second yellow card.